Eating healthy doesn’t mean sacrificing flavor. Here is a satisfying meal to fill your stomach, while also keeping the health of your heart in mind. This chili recipe consists of five heart-healthy spices and several other healthy ingredients, such as antioxidant-rich tomatoes, capsaicin-packed peppers, and fiber-filled red kidney beans. This is healthy eating made easy and a perfect recipe for Heart Health Month. The recipe calls for five spices – cayenne, garlic, turmeric, ginger, and cinnamon – that are packed with potential healing agents. Cayenne is a popular spice filled with capsaicin and flavonoids. Capsaicin not only gives cayenne its heat, it is also responsible for many of its health benefits, including improved circulation. Garlic is rich in health-promoting sulfur compounds that contribute to multiple health benefits – including lowering cholesterol. Turmeric, a popular spice in Indian cuisine, contains curcumin, which is well known for its anti-inflammatory effect. Ginger and cinnamon are popular spices in sweet foods and desserts in Western cuisine. But in this savory recipe, when paired with the natural sweetness of black cherries and brown sugar, they bring a nice balance to the smoky and spicy heat of the chipotle and cayenne peppers. And both ginger and cinnamon contain powerful antioxidant and anti-inflammatory properties that support heart health. In addition to containing five heart-healthy spices, the recipe incorporates other ingredients that support cardiovascular health. For example, take tomatoes, which are filled with lycopene, a carotenoid that has many heart-protective qualities. Kidney beans are full of fiber, which keeps you feeling fuller longer and might help reduce LDL cholesterol, and they are also a great source of essential minerals such as iron, copper, folate, and manganese. And just like cayenne pepper, the chipotle peppers in this recipe are also rich in capsaicin. In a large pot over medium heat, heat the 2 tablespoons of olive oil. Add ground chicken (or turkey) and season with salt and black pepper to taste. Cook the chicken for 5-10 minutes until completely browned and no pink remains. Add carrots, onion, garlic, and bell peppers to the meat. While stirring occasionally, cook the vegetables until they are soft (about 5-8 minutes). Stir in the seasonings – cumin, turmeric, chili powder, cayenne pepper, cinnamon, ground ginger, and adobo sauce. Add tomatoes, cherries, chipotles, brown sugar, water, and chicken broth. Stir everything together and bring to a boil. Cover and reduce to a low simmer, stirring occasionally. Cook for 10 more minutes, then add the kidney beans. Cook for another 3-5 minutes, then remove from heat. Let chili cool for 5-10 minutes before serving. Optional: Simmer on low heat for 30 more minutes to let the flavors meld. 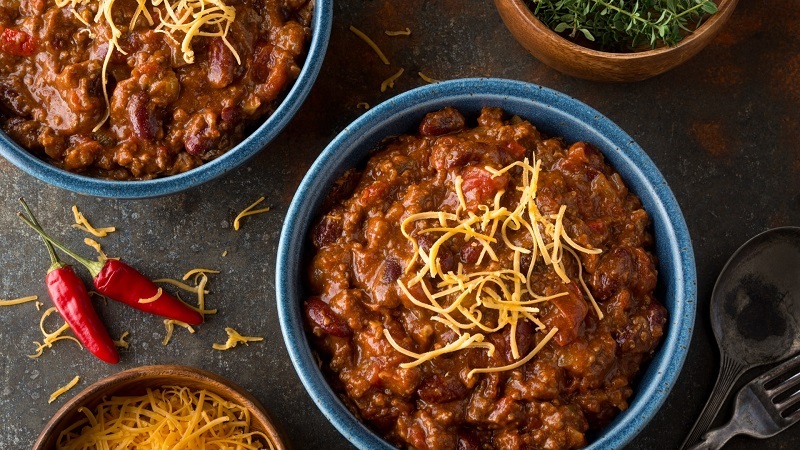 Optional serving suggestions: top the chili with shredded cheddar cheese, add a dollop of plain yogurt, or pair with a fresh slice of cornbread. For vegan-friendly chili: To make this recipe vegetarian or vegan-friendly, swap the ground chicken or turkey for tofu and use a vegetable-based broth instead of chicken broth. You can also forego the meat or tofu altogether and add another can of red kidney beans.